You're finished with the Fiber U Premises Cabling course - congratulations! 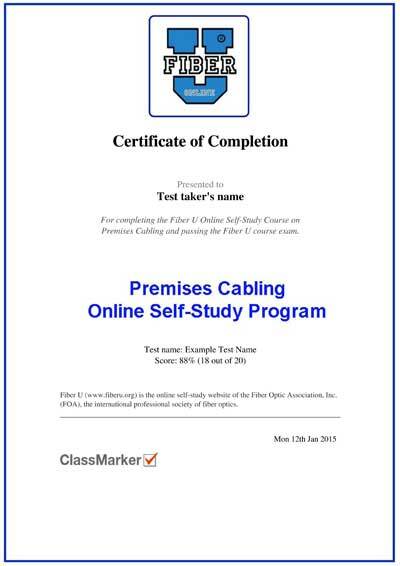 Now you have completed the Fiber U Premises Cabling online self-study course, you can now take an online exam and, when you pass the exam, get a "Certificate of Completion" for this course. You should complete all lessons including taking the quiz ("Test Your Comprehension") at the end of every lesson. When you think you are prepared, you can take an online exam for a nominal fee ($20) which will give you a "Certificate of Completion" for this course. Please note: Receiving this Fiber U Certificate of Completion does not include FOA certification or membership but it does become documentation of your knowledge of fiber optics and should be part of your portfolio of documented knowledge, other training and work experience that can qualify you to apply for FOA direct CPCT certification through the FOA "Work to Cert" program. The Fiber U Premises Cabling self-study program offers you the opportunity to take this exam and when successfully completed, receive a "Fiber U Certificate of Completion" for your work. You should not take this exam until you have completed all the Lessons in the Fiber U Basic Fiber Optics course online and completed all the Quizzes at the end of each lesson plan. You may take the exam three times over a 90 day period if you do not pass the first time. The references for all questions on the exam is the Fiber U Premises Cabling course online and its references to FOA textbooks, YouTube videos and Online Guide. You must pay a registration fee to take the exam and get a Certificate of Completion. The fee is $20US payable by credit card or PayPal. If you do not pass the exam on the first try, you have a second chance within 90 days. Your registration information and scores will be sent to Fiber U. Print and keep your certificate. I will be useful as proof of study should you decide to pursue other certifications. You must first complete all lessons of the Fiber U Premises Cabling self-study course and successfully complete an exam on the course. The exam is 50 multiple choice, multiple answer and true/false questions. You must answer every question - no questions may be left unanswered. You may go back during the exam to change your earlier answer. The test is closed book and has a 1h30m time limit. Each test is unique - questions are chosen at random from a large selection and randomized (about 10E64 - 10 and 64 zeroes -possible combinations!) If you take the test a second time, you will get a different exam. When ready, go to http://www.classmarker.com/online-test/start/?quiz=4a754b43b14e8a5c to register, pay and take the exam.